C'mon you lot. For the cost of 2 spark plugs you can sponsor a team rider. I second that !! Thanks for getting me on the team Richard ,in the meantime come on you lot get signed up !!! How about, every time you post on any topic you refer to DGR. I imagine that many readers are not looking at the Chat, off topic... area of the forum. Admin, would you consider a broadcast, so all members get a notification about the DGR forum team? Re: Distinguished Gentlemen's Ride Team. TIME IS RUNNING OUT. Time is running out gentlemen. Join your local Distinguished Gentlemen's Ride. If you can, contribute to the worthy cause of raising funds for prostate cancer research (yours isn't getting any smaller) and men's suicide prevention. Several (11, I think) members have already signed up, but really, with over 1000 members, we should be much better represented. I think I'm a bit embarrassed for myself and others here whose suggestions to join have raised so little enthusiasm. See below, for the BSA A7/A10 FORUM DGR team page. If you need help navigating the DGR site, I would be pleased to provide it. Sadly I will not now be able to attend the ride this year. It is conflicted with a Sister in Law's celebratory birthday lunch and I have been told that I will need to reprioritise. Hope the weather holds for you all and that you are able to ride dapper. Sorry you won't make it. Family should come first. All the best and birthday wishes to sister-in-law (really). I registered in the Portland Oregon ride... I got my bike running good, and just did a long ride to the Cannonball run and back, Will try and get something vintage running to add style points, But at least I can participate on 2 wheels. Last year I think I raised over $200?? Ill have to look! Ill be campaigning heavily in the interim, But last year many from a veterans forum kicked in a few $$$$. Maybe someone or 3 can kick in a few bucks so I dont look like a slacker?? Can I join the BSA Riding group even though likely I would be the only one in my area?? 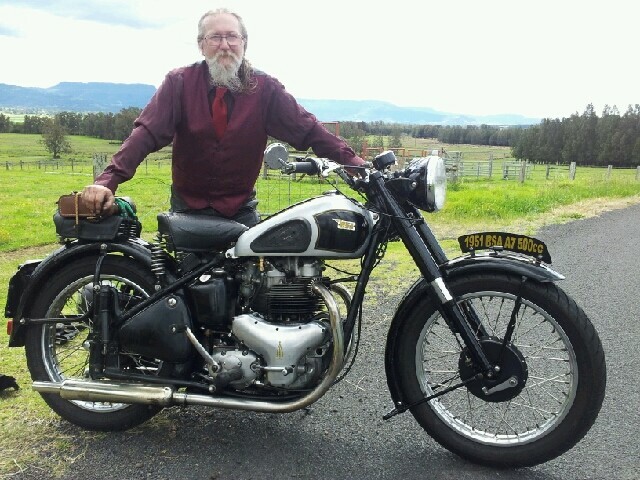 I doubt I will have a road ready BSA by the ride time and project bikes wont cut it. The local ride is over 2 hrs long but all city riding. (lots of stop & Go) and they want the details kept quiet but I CAN say it starts at 2 stroke Coffee shop in Portland. You can join our team by following the link in Richardl's post above ^^^. The more the merrier. The Kiwi's will be first away followed by east coast Aussies. I'll be pouring myself to bed by the time you start LOL. Done, Im signed up with the BSA forum team. I am going to be sending out tons of requests for donors so, trying to get all my badges filled in. I also donated to others, and donated to myself so I have at least some money on my dashboard despite not having a lot of money at the moment. I think its shameful as I said already so many sign up but dont raise any money. Even a few dollars makes a difference. I have a long time friend who died last winter from Prostate cancer. At first he thought it was a bladder infection, being stubborn as many of us are,, he put it off. His cancer was very aggressive and in 3 weeks he was dead. Im already running on second chances and a miracle I survived my injuries in 2013, So I dont take anything for granted and pleased every day I live another. ...Im signed up with the BSA forum team..
Well, always next year, "A man without a plan has no future".. However if its distance to the closest ride register and form your own ride. (Easy to do, and likely you have a route you can pencil out) You CAN of course register and raise money and not actually ride, and thats cool as well, although less exciting, but at least you are being proactive for raising money. The ride is more of a promotional and celebratory event, Its the money raised that is key. We have a massive toy drive locally with bikers I have been attending most years for 30 some years, even when it snowed, But the toys are largely symbolic as we actually collect so many gifts and toys the hospital crates it up and shares with other hospitals. However its the MONEY raised that does the real good. It funds wheelchairs, artificial limbs, and medical devices for kids. If a kid falls thru the cracks, the biker fund steps in and helps out. THAT is where the tire meets the road. Usually a $80k to $100,000 per year. Shriners childrens hospital in PDX Oregon. The toys are cool & all,, but symbolic at this point. Last year I registered and raised a few hundred from people I pestered and cajoled, and again, NONE goes in the riders pocket. However I got sick again so I attended the event but did not actually ride. My health is better this year so RIDE I SHALL. But publicity is always welcome,. Please do, multiple posts on whatever media you can. I had an idea.. I am going to gather up some cool Motorcycle stuff I have and run a personal raffle,,,Every person that donates to my profile gets their name in a drawing to win some cool MC parts, stickers, hat, Shirts etc.. looking for what I can put together. Maybe consider this yourselves and offer up a GIFT certificate for X amount of $$$$$ and every donation to your profile gets their name in a hat... Draw the name on day of ride, Someone wins the gift certificate. I know you guys are on multiple forums and it would build some interest. See?? There IS something you can do right now! 14 members in the forum team. Woot! Could be so many more! It's not too late guys!